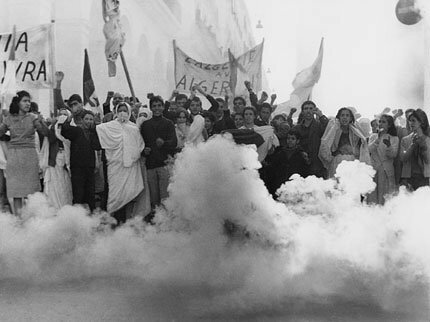 On 17 December 2012, Ken Loach summed up the personal significance of The Battle of Algiers for him, in our project situating Algeria’s history, society and politics within the wider context of the Arab world. Ken Loach is one of the Britain’s most important film-makers. Born in 1936, his directing career began in television in the 1960s with episodes of the gritty British police drama Z-Cars followed by the television play Cathy Come Home (1966) - groundbreaking in the way that it confronted homelessness and unemployment – before moving into film-making with Poor Cow (1967) and Kes (1970). Often described as a political film-maker, his 1995 film Land and Freedom narrates the story of David Carr, a British Communist who fights on the republican side during the Spanish Civil War, while his 2006 film The Wind That Shakes the Barley deals with Irish War of Independence and the subsequent Irish Civil War. He is currently making a documentary on the place of ‘1945’ in British culture. Martin Evans: Why is Gillo Pontecorvo’s film The Battle of Algiers important for you? Ken Loach: It was anti-imperialist film. It told the story from the point of view of ordinary people. It used non-professional actors. It was not over-dramatic. It was low key. It showed the impact of colonialism on daily lives. These techniques had an important influence on my film making... I saw the film when it came out in 1966. It was one of a number of films that influenced me. Q. Did you know Gillo Pontecorvo? A. I met Gillo Pontecorvo through the Venice Film Festival and we became good friends. I chided him for not making more films. A lovely man, with a twinkle in his eye, he was very political. He was a communist. He had been a partisan in the Italian Resistance and this clearly influenced the way in which he made the film. Q. How does The Battle of Algiers continue to speak to the contemporary world? A. It continues to speak to the contemporary world because of imperialism, because of what the USA and Britain are doing in Afghanistan and Iraq. The film is about the coercion of the local population. But it is also about how a local population can use local knowledge to win a guerrilla war... As long as imperialism is around it will be an important film. This article is part of the Algeria and the Arab Revolutions: Pasts, Presents and Futures partnership, funded by the University of Portsmouth and the University of Sussex. Read more about openDemocracy's editorial partnerships programme.